Place 1 or 2 drops in each eye 2 or 3 times daily. 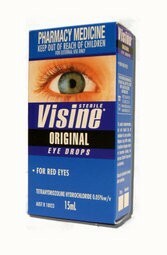 Visine is not recommended for use in children under 6 years of age except on medical advice. For use in the eyes only. Do not touch the dropper tip to your eye or any other surface. Replace the cap after each use. Remove any soft contact lenses before using Visine Allergy Eye Drops. Soft contact lenses can be reinserted 15 minutes after using Visine Allergy Eye Drops. Visine Allergy Eye Drops are not to be used by children under 6 years of age, unless otherwise directed by your doctor. Not to be used by individuals with glaucoma or other serious eye diseases except under the advice and supervision of a physician. Discard contents 30 days after opening.